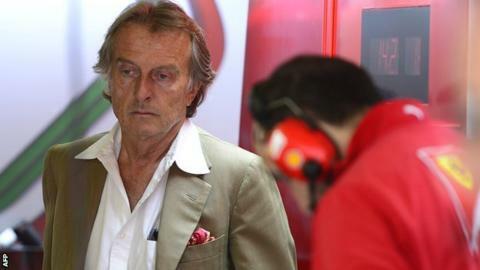 Ferrari president Luca Di Montezemolo says he is "not happy" with the team's lack of competitiveness this season. "I did not expect a team so much less competitive than my expectations at the beginning of the season," he said. "I have to understand where are the problems, why we are not competitive and to improve the situation as soon as possible without losing calm." Di Montezemolo said he had been told the team would make a step forward in time for June's Canadian Grand Prix. "I expect improvement in the car in Canada, from the meetings I have had in the last few days," he said. Ferrari have achieved only one podium finish in the first four races of the season, by Fernando Alonso at the last grand prix in China. Raikkonn qualified sixth in Spain, one place ahead of Alonso, and was 1.8 seconds slower than pole-sitter Lewis Hamilton in the Mercedes. Di Montezemolo added that he "shared the frustration" of Alonso in failing to win a title since the Spaniard joined the team in 2010. "The problem is to have a competitive team and not to follow the problem of the drivers, even if I totally agree that a driver like him needs a competitive car," Di Montezemolo said. "I am sure Ferrari has all the capabilities, all the opportunities to go back to the victory. We have to react to improve the situation." Di Montezemolo said he was working more closely with the F1 operation since the resignation of former team principal Stefano Domenicali following the third race of the season in Bahrain, where Alonso and team-mate Kimi Raikkonen finished ninth and 10th. He backed Domenicali's replacement, Marco Mattiacci, to "do a good job", but added: "He needs a full immersion; he has just arrived." Raikkonen has struggled to keep pace with Alonso since re-joining the team this season, but Di Montezemolo said he expected an improvement from the Finn. "Kimi has improved step by step," Di Montezemolo said. "I know him very well. He is a fantastic driver. He did not feel comfortable with the car. I spoke a lot with him today and he is more pleased with the car and I think he will be even more pleased in the near future."